One of the most beautiful spots in Japan is the bamboo grove in Kyoto’s Arashiyama. Sadly, tourists have been defacing the natural beauty by carving their names on the stalks. If you don’t know how beautiful Arashiyama’s bamboo grove is, check out this photo Kotaku reader Aeron sent us a few years back. Or this one (below) reader Shaun sent. Nature at its best, right? 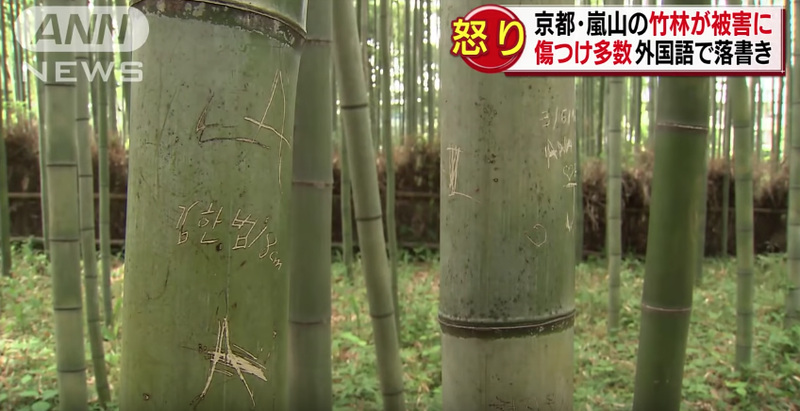 According to Mainichi, tourists have been carved their names into at least 100 bamboo stalks. Names and initials are written in English, Korean and Chinese. ANN reports that the cravings increased this past February. “The visitors might have carved their names to commemorate their trips, but we can’t accept such behavior which could disappoint many other tourists who are looking forward to enjoying the scenery of the forests,” a Kyoto city official told Mainichi. To deal with the damage, Kyoto has been putting green tape over the unsightly engravings, which damage otherwise healthy bamboo, causing it to rot. One official in charge of the area told ANN that there is no other choice but to chop down the defaced bamboo.